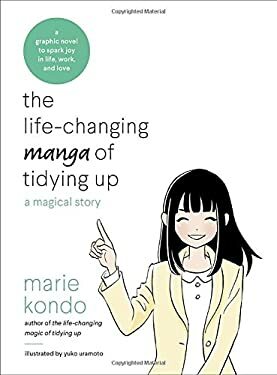 From the #1 New York Times best-selling author and lifestyle/cleaning guru Marie Kondo, this graphic novelization brings Kondo's life-changing tidying method to life with the fun, quirky story of a woman who transforms her home, work, and love life using Kondo's advice and inspiration. Marie Kondo presents the fictional story of Chiaki, a young woman in Tokyo who struggles with a cluttered apartment, messy love life, and lack of direction. After receiving a complaint from her attractive next-door neighbor about the sad state of her balcony, Chiaki gets Kondo to take her on as a client. Through a series of entertaining and insightful lessons, Kondo helps Chiaki get her home--and life--in order. This insightful, illustrated case study is perfect for people looking for a fun introduction to the KonMari Method of tidying up, as well as tried-and-true fans of Marie Kondo eager for a new way to think about what sparks joy. Featuring illustrations by award-winning manga artist Yuko Uramoto, this book also makes a great read for manga and graphic novel lovers of all ages. New (885 available) BRAND NEW. Over 1.5 million happy customers. 100% money-back guarantee. Make your purchase count: support Better World Books' worldwide literacy partners.